Are you prepared for corporate reporting’s perfect storm? Despite signs of recovery, today’s economic environment remains uncertain. As companies continue to seek growth in developed and rapid growth markets, challenges clearly remain. You need to continue keeping a close eye on costs and carefully manage cash flow. You also face an increasingly complex and rapidly changing regulatory environment, in which changes to accounting guidance can impact business decision-making. And you need to anticipate the impact of key business decisions on your accounting and financial reporting. FAAS comprises a multidisciplinary team of accounting, tax, and IT professionals with deep, sector-specific experience in managing the implementation of accounting changes, ranging from a single accounting standard to the full project planning and global implementation of IFRS. We help CFOs, audit committees, treasurers, and other top financial executives understand the pending changes and assess the impact on their companies. Our Financial Accounting Advisory Services (FAAS) practice provides assistance on critical issues arising from changes in accounting standards and regulatory requirements, new business activities and business acquisitions. Stay connected with us through social media, email alerts or webcasts. 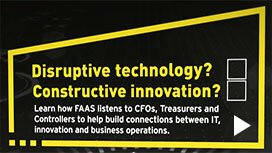 Or download our EY Insights app for mobile devices. Are you ready to ACT on enhancing your business through revenue recognition and leases? Can innovative corporate reporting build trust in a volatile world? How can reporting catch up with an accelerating world?